No bedroom is truly complete without at least one of our gorgeous bedside tables in 100% solid hardwood. There’s nothing that completes the styling of your bedroom quite like a bedside table. It offers storage, fantastic looks, and really pulls together the look of a space. We’ve designed lots of gorgeous styles for you, so you can find the perfect look for your space, all in solid hardwood oak, mango, and painted hardwood. We offer more than 20 styles which match our exclusive furniture ranges, featuring shelves, drawers, cabinets and more, so you can always find a bedside table which meets your style and storage needs. Made using only high quality timbers, and with traditional carpentry techniques, such as dovetail joints in the drawers, these stunning pieces are robust and durable to last through the years. And while you're at it, don't forget to shop one of our stunning solid hardwood beds, designed to perfectly complement your new bedside table. Create a classic look with two of the same table framing the bed, or mix and match styles for a more eclectic look. 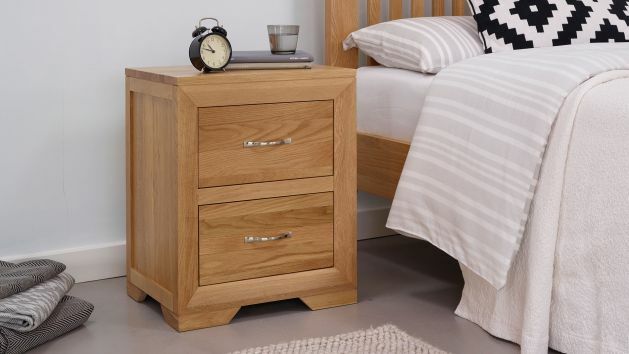 Browse our wide selection of bedside tables and don't forget about our free delivery options to the room of your choice, which comes as standard with any purchase from Oak Furniture Land!